The owners of this 1945 San Marino home were bored with their garden. They would be the first to admit that they hadn’t spent more than forty hours there in forty years. What they needed was a space that worked for them, not one that they would have to work hard to maintain. They called on landscape architect Heather Lenkin to transform this outdoor space into a place they could relax, unwind and entertain. 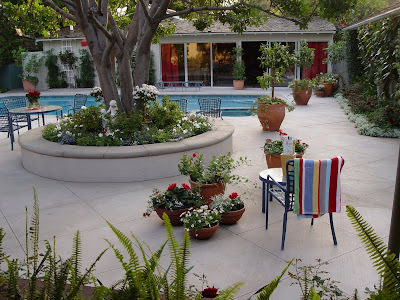 Existing blue furniture was dressed in red and white cushions and grouped with pots planted to match. color, is a place to rest and enjoy fragrant jasmine, white solanum, white climbing roses and gaze at full white hydrangeas. 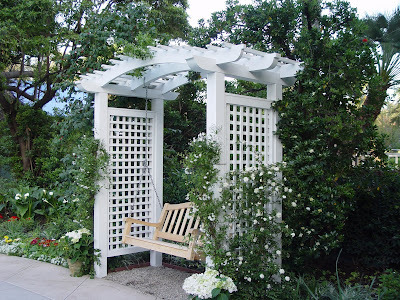 A prized holly from her grandfather’s farm in Virginia was shaped and incorporated into the trellis over the swing. 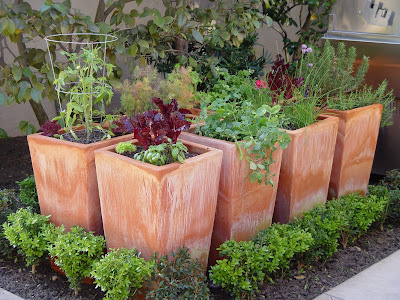 A space for outdoor grilling was drastically transformed by the addition of a stainless steel barbeque situated within a set of sixteen square shaped terracotta planters fashioning a contemporary twist on a traditional herb garden while elevating it to an accessible height. 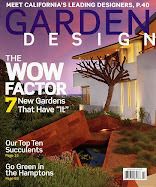 Red unifies the garden and links it to the interior of the house and the client’s personal history. 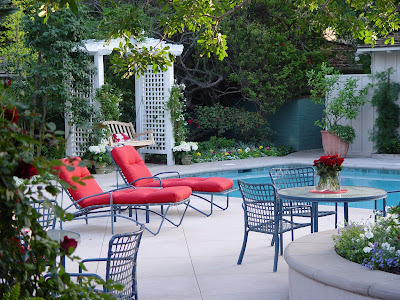 “The owner loves the color red – I saw that the first time I went to the house,” Lenkin recalls. 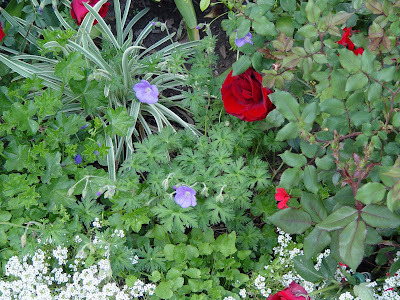 When she learned the owners had lived in Austria and that their home is host to Austrian visitors, the red and white of the Austrian flag became key in plant and fabric selection. “The color suits t perfectly. It is a color for a specific type of personality. No shy violets or wallflowers for this strong and passionate woman.” Lenkin couldn’t resist using the climbing rose ‘Don Juan’ playing up the garden’s passionate themes. The strength of this limited palette is a fantastic example how a monochromatic color scheme can be successfully employed in the garden.